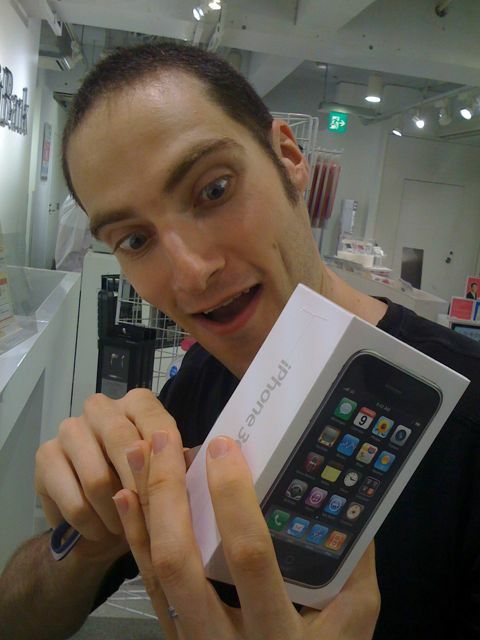 When I figured out that if I cancelled my current iPhone 3G contract and bought a new iPhone 3GS, I’d end up paying almost exactly the same on a monthly basis as I already did, I was straight out of the house and on a train to Shibuya to the Softbank store. In Japan, the general rule for iPhone users who want to upgrade is, well, you can’t. You just have to pay off the remainder of your 3G contract at the regular monthly rate – in my case this is 17 months at 3,360 yen – a grand total of 57,120 yen (US$600, UK£360 payable on a monthly basis) – then take out a new iPhone 3GS contract at the discount rate of 780 yen a month (with unlimited data but excluding calls this totals about 6,500 yen / US$68 / UK£41 a month). Anyhow, nevermind the numbers, what about the thing itself. OMG it is a beauty! Here, in this video which was recorded, edited and uploaded direct to YouTube by the iPhone itself, I explain why it is the new love of my life. As I say in the video, I’ll be GIVING AWAY MY iPHONE 3G FREE to a listener of my podcast Japan Podshow – the iPhone is in very good condition and will come with brand new headphones / charger / cable and the box. n.b. You can tell this was edited on the iPhone as I managed to irreversibly cut the first 5 seconds of the video off – and there’s no undo!